Driscoll Babcock Galleries presents Disturbing the Peace, Margaret Bowland’s second New York solo exhibition of psychologically provocative paintings. Bowland draws upon legendary American novelist and social critic, James Baldwin’s, rallying cry that, “Artists are here to disturb the peace,” by creating a very personal series of works which questions societal expectations about gender, race and beauty. The majority of the works focus on JJ, Bowland’s muse for the past five years. Now eleven years old and on the verge of adolescence, she prepares to face the challenges of adulthood. Upon her tiny frame, weighty universal issues are placed – questions of identity, pressures of conformity, and ultimately a quest for acceptance. In Painting the Roses Red, JJ’s brown skin is coated in a layer of white paint as red paint drips down upon her head and her rose-accented dress. Throughout many cultures and periods – from England’s Queen Elizabeth I to the geishas of Japan – white makeup has been applied to mask individual characteristics and emphasize other “more important” attributes from innocence to economic status. 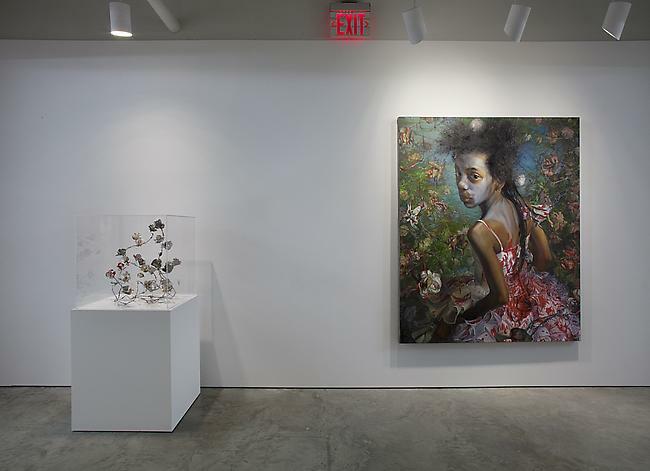 In 21st century America, the application of white paint onto an African American girl not only carries this historical weight, but also the baggage of racial inequality and varieties of slavery imposed by contemporary cultures. The desire and compulsion to not “leave well enough alone” is of course not limited to race or gender, rather, it is much more far reaching, all-inclusive and damaging. This danger is highlighted in the painting’s title, which references the Queen of Hearts from Alice in Wonderland, who orders her minions to paint all white roses red. In Disney’s animated film, they sorrowfully sing, “Oh, painting the roses red, And many a tear we shed, Because we know, They'll cease to grow, In fact, they'll soon be dead, And yet we go ahead, Painting the roses red.” White Fives further underscores this menace. Here the “roses” are fabricated out of five dollar bills and barbed wire–the spikes of which enclose and contain the figure, threatening at any moment to prick. A fully-illustrated catalogue accompanies the exhibition with an essay by Leola Dublin Macmillan, original poem by Randall Horton, and introduction by Tess Sol Schwab. 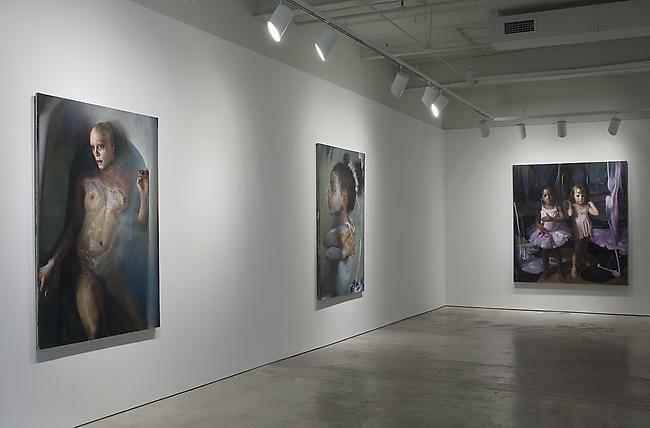 Born in Burlington, North Carolina, Margaret Bowland is represented exclusively by Driscoll Babcock Galleries. 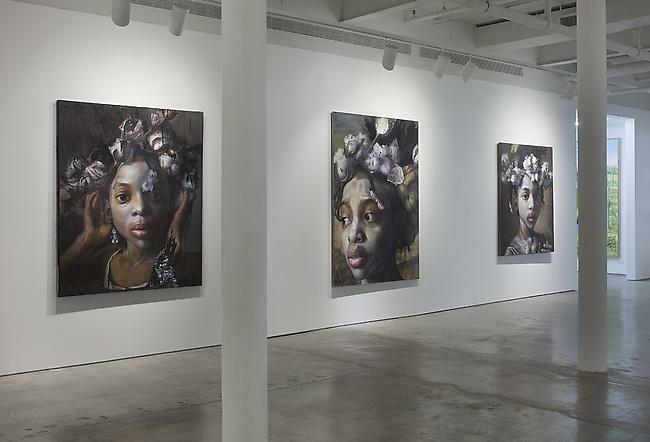 Her work has been shown at institutions including the Smithsonian National Portrait Gallery, where she was the recipient of 2009’s Outwin Boochever Portrait Competition-People’s Choice Award. In 2011, the Greenville County Museum of Art featured the exhibition, Margaret Bowland: Excerpts from the Great American Songbook, accompanied by a catalogue with an essay by Siri Hustvedt. "Margaret Bowland Disturbs the Peace"